CELEBRATING OVER 20 YEARS OF SHARING FATHER'S LOVE LETTER! Father's Love Letter is available in many different media formats for you to freely share with others. All of the resources on this page can be freely downloaded and shared with others. Our goal is to see this simple expression of our Heavenly Father's heart shared with every person on the planet! You are welcome to create your own design of text version if you like providing you use it in its entirety. We also have many other creative ways to share God's love at our GodLovesYou.tv website. We would love to hear how you are sharing it so please feel free to send us a message from our contact page. SHARE FATHER'S LOVE LETTER CARDS! 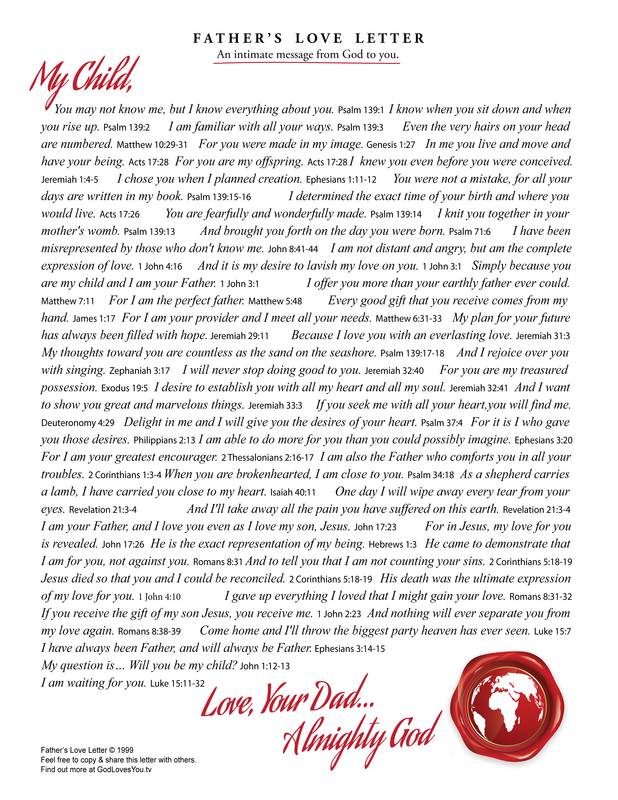 We have a collection of free, downloadable Father's Love Letter cards for every special occasion available as free downloads at GodLovesYou.tv. Each print master is optimized for both 8.5 x 11" letter and A4 formats. To mark 20 years of sharing the Father's Love Letter, we created a 20th Anniversary Edition of the much loved Father's Love Letter video that is available as a free download. This new version of the video is NOT available on DVD. These 60 second Father's Love Letter excerpts are available to be broadcast on radio, television or on the Internet. ​Higher quality video spots are available upon request.